This recipe is a simple and quick version of making chicken gravy. Indian recipes always has a lot of ingredients and spices in it this chicken gravy is one among them. Adding the right ingredients in exact proportion makes the dish taste more delicious. This chicken gravy is made without coconut and i can guarantee you that you are gonna love it. Due to its simplicity and easiness my mom prepares this gravy on every Christmas and Easter night before the mass starts so that we can have our second dinner as soon as we come back from church. My favorite combination is this curry with a plate of parotta. Oh my god my mouth is watering thinking of it. Step 1) Heat oil in a pan and add the whole spices cinnamon, cardamom and cloves, whole spices gives nice awesome flavor to the recipe.Then add the chopped onions, some salt and saute until the onions are nice and golden. Step 2) Once the onions are golden add the masalas turmeric powder, ginger garlic paste, cumin powder, Garam masala powder, coriander powder and red chili powder. Mix it once and immediately add the tomatoes.Add a little bit of water to prevent the masalas from burning and cook until the tomatoes turns into a paste. It is very important to cook until paste to get nice smooth gravy, otherwise you can grind the mixture and add it to the pan. Step 3) Once the tomatoes are nice and soft add the chicken pieces ,salt and required water. Mix it well, cover and cook it for 15-20 minutes or until the chicken is fully done. Step 4) Once the gravy thickens and chicken is cooked thoroughly add a handful of coriander leaves for garnishing and turn off the heat. Our delicious chicken gravy is ready to be served. You can always adjust the consistency according to your preference.If you want a lighter gravy then add a little extra water and make it light.This recipe is very easy to make that's why its my favorite recipe of all time. It is a good accompany for many dishes like Chapathi, roti, Idli, Dosa and even with rice.Please give this simple chicken gravy a try and share your feedback. Chicken gravy is an authentic indian recipe made with lot of indian spices and masala.This recipe is very easy to make and tastes delicious.This mouthwatering chicken gravy is an excellent sidedish for chapathi, roti and lot more. Our chicken Gravy is ready to be served. I will upload more recipes soon, I will be waiting for your feedback. Happy Cooking. Steffi the chicken curry has come out delicious :) we r gonna hv it for christmas! Thank you so much. Angela. Really enjoy your recipes. This one is big success. Very easy and delicious. Have been searching for this taste for a long time. Finally found it here. Also tried your Chicken dum Biryani recipe. That one is a bit involved. Need to practice more. Hi Wilson thank you for your feedback. I can help in troubleshooting the Chicken dum biryani if you provide me some more details. Wish you a Merry Christmas and a Happy New Year ! Thanks. Angela. Merry Christmas and Happy New Year. I'm having trouble making fried onion. The first time it's burned and the second time it's soggy. I found some fried onion in an Indian grocery store, but it's still not like the one in your video. Another problem I have is the rice. I soaked the rice for 30 minutes and then put it in the boiling water with the ghee and herbs. Only boiled the rice for 5-10 minutes. Still after the recipe is done, the rice is always too soft or broken to maintain the rice shape when I scooped it up. But the taste is wonderful. One more question is how many stems of saffron do I put in the milk to make the saffron milk? The next I'm going to try on your list is either the chicken vindaloo or korma. +WILSON MAK Regarding onions, cut the onions into thin even pieces. The onions will deepen in color after removing them from oil. So they can be golden brown when taking out of oil and then they will reach a darker brown color. Also the water content of onions matter. Sometimes the onions hold a lot of moisture while some other batches might be dry. If you notice excess moisture in the onions while slicing allow them to dry out for about an hour and this while enhance the browning. Also after removing the fried onions from oil don't place them on kitchen towel to absorb the oil. The heat will get trapped in the paper and cause moisture to condense causing the onions to be soggy. First cool them off in a colander and them remove the excess oil. Regarding the rice, since the rice is pre-soaked the rice will cook to 100% in 5-7 minutes. So ideally the collection of rice should be begin earlier. Also the time depends on the brand and quality of the rice. Start testing the grains of rice from 3 minutes on, keeping in mind that you need to collect it at 50% , 70% etc. For Saffron milk, I use about 15 strands of saffron in 2 Tbsp of warm milk. I would suggest the korma as it has more Indian touch to it compared to vindaloo(it is also a little spicier). 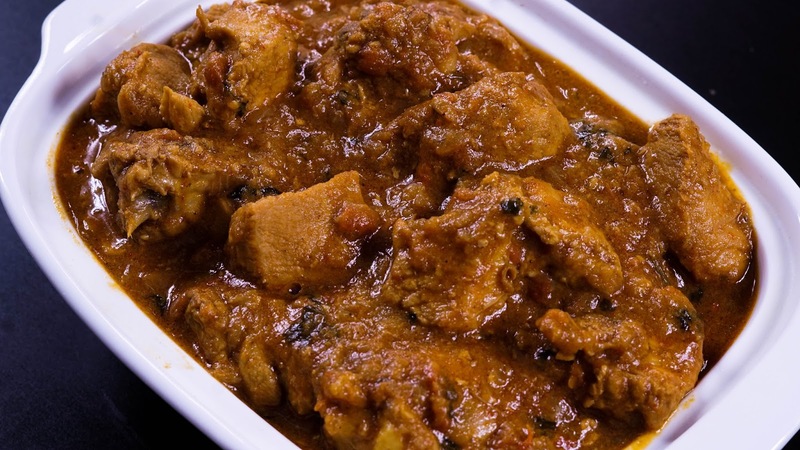 Vindaloo uses less oil and has a very unique taste as it is an adapted recipe. All the best and happy cooking !! Angela. Thank you so much for the detailed explanation. I'll keep those suggestions in mind. I can never imagine there is so much knowledge in frying onion. I made the exact mistake in trying to absorb the oil with paper towel. Next time I'll start the rice for 3 minutes and see. I tried the Chicken Korma and the Palak Chicken (since my wife wanted it) two days ago. They are both very delicious, in very different ways. The fragrance of the cashews and poppy seed is irresistible. I love them both. I made a mistake along the way, misread the salt measure from tap to tbsp. The Korma was to salty. I need to get a new blender. It didn't grind the Korma paste too well. Wilson, sorry about your salt mishap. I am happy that you liked those recipes. Please keep on trying more recipes from our website. If you ever hit on a bump, I am more than happy to troubleshoot it for you. All the best and Spread the Joy of Cooking!! Angela. Is there any particular brand of rice you use for biryani cooking? If I don't have a tawa, can I just turn it down to the lowest for the last 15 minutes? I also see you use a stainless steel blender. Where can I find one? Thanks. Hi Wilson, I have had good experience using INDIA GATE Basmati Rice and ROYAL basmati rice and yes you can turn down the heat to the lowest setting. Regarding grinding spices I have a Capresso spice grinder(http://amzn.to/2i30khH) for coarse grinding (approx 200watts) and for making fine powders and heavier work loads I use a stainless steel grinder from PREETHI (http://amzn.to/2iOs9sP) I use this brand because it is popular in India and my mom used it. Good luck on your Biryani and kind share your feedback after trying the recipe. Thank you very much. Angela. Superb chicken curry..my mouth waters just looking at it !! Mark, Thank you for your wonderful comment. I am glad you liked the recipe.